This is not a new method for which I can take ownership. Its a widely known method which I am just putting here. Lets take the simple formula for the circumference of the circle. Now S is the circumference of the circle. So if we know the radius and circumference of a circle accurately we can get the value of pi. Now, getting that is a bit tough, so we will have to go by approximation. 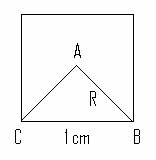 For example, lets take a square (polygon with 4 sides) of side 1 cm in length. Now, I can call a sqaure as an approximate circle (very approximate indeed). Now the radius of this square is approxmately half the length of the diagonal (or the length of one of the line of the angle foming the vertex. Lets call it R.
Now this is the approximate value of pi we get when we considered the square to be a circle. Now as we increase the number of sides in the polygon, the shape gets closer to a circle. By definition, a circle is a polygon with infinite sides. Here is where we get in SQL Server to see how this theory hold good as we increase the number of sides. Please note that the query given below is to test the above theory and is not proposed as a way to calculate pi in SQL Server. The following query gives the corresponding value of pi as we increase the number of sides (in steps of 2) from 4 to 65532. Run the query and check out the result for yourself. Try changing the step to 2000 with the seed as 4 and you will notice that, when the number of sides of the polygon reaches 50 million (in the result), you will have corresponding the value of pi equal to the result you get from this query. The above query was written for SQL Server 2005 (using cte). It can be rewritten by using number tables if you get the idea. Try this query. It gives the value of pi when you aprroximate a 100 million side polygon to a circle. if you are looking at calculating the value of Pi without using any of the built-in functions, then you may want to use this method. And its just an implementation of another well known method. Your calculation is using pi to calculate pi- It is simply wrong.